For broth, dissolve 1 cube in 1 litre or boiling water. For more concentrated broth, dissolve 2 cubes in 1 litre or boiling water. In a big sauce pot, boil water with pork kasim and onions until pork is tender. Add Knorr Pork Broth cubes, carrots, corn and Baguio beans. Simmer until vegetables are tender. Mix in repolyo. Season with patis and pepper. Allergy Advice: Contains Celery, Wheat, Crustacean, Soya, Milk, Egg. Once opened, store in a cool dry place. Avoid direct sunlight. Ingredients: Salt, Flavour Enhancer (E621), Partially Hydrogenated Palm Oil, Sugar, Flavouring (Contains Celery, Wheat, Crustacean), Pork Meat & Fat (10%), Hydrolysed Soya Protein (Contains Milk), Spices (Onion, Pepper), Garlic, Aromatic Palm Oil, Egg Powder, Corn Starch, Natural Butter Flavour. 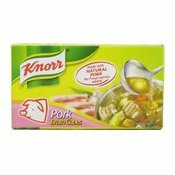 Simply enter your details below and we will send you an e-mail when “Pork Broth Stock Cubes (豬肉粉味湯)” is back in stock!